Any process that produces substances that are small and light enough to be carried in air, or are gases themselves, can contribute to air pollution. These sources can be natural or man-made and occur all at once or slowly over time. Sources can be localized, such as industrial complexes, or come from multiple producers, such as cars. They can be indoor or outdoor, and even if pollutants are present, this does not mean that they are dangerous to health, as long as they do not exceed safe limits set by organizations such as the U.S. Environmental Protection Agency. 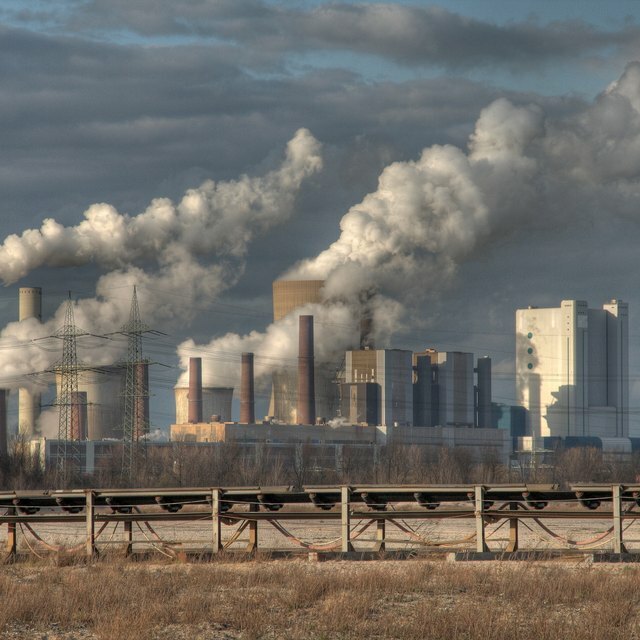 Almost all of the common air pollutants can be produced by industrial processes. Some of these are produced by combustion of fossil fuels that drive the industrial process, resulting in particulates, ozone and nitrogen oxides. Common forms of transportation like cars, planes and ships generally use combustion to harness energy from fossil fuels. The combustion process releases pollutants into the air, such as particles and carbon monoxide, and also releases substances that quickly form into nitrogen oxides and ozone, which are important air pollutants. Farmers use machinery driven by fossil fuels to plow fields and harvest produce, and the animals that are raised in bulk for food also produce their own type of air pollution. Methane is a gas that contributes to the greenhouse effect that allows global warming; it arises from intestinal gas released by livestock. Keeping homes warm is commonly the job of fossil fuels such as oil, gas and coal. Their combustion means that heating is an important source of air pollutants like sulfur dioxide. If electricity is used to heat the house, the energy plants that produced it may also have been driven by fossil fuels. The energy used in cooking may have come from energy plants, in which case the potential for air pollution has arisen earlier. Alternatively, such as in developing countries, home cooking requires direct burning of wood or coals, which produces the particulate pollution at the point of use. Sometimes people think of air pollution as entirely man-made. In fact, natural processes release lots of substances into the air that are classed as pollution. Sulfur dioxide is a major modern air pollutant, and according to National Geographic, volcanoes can release enough sulfur dioxide into the air to influence global cooling. Forest fires release pollutants into the air in the same way as fireplaces burning wood produce pollution. They produce fine smoke particles, which, according to the EPA, are small enough to be able to get into the lungs and damage the lungs and the heart. In the developing world, homes may have visible smoke coming from the fire that is used to cook and heat the home. In the developed world, tobacco smoke is commonly the only visible type of air pollution inside the house. Both types of indoor smoke are linked to respiratory diseases. Specific industries produce particular air pollutant profiles, and the major source of metal pollution like lead is metal smelting, although niche uses of lead, such as in the manufacture of certain aviation fuels, also contribute. Chlorofluorocarbons (CFCs) in aerosols were a major cause of ozone layer destruction, and their production was banned in the United States in 1995. Despite such bans worldwide, the U.S. National Library of Medicine says CFCs can last for a century in the atmosphere, where they continue to do damage. The ozone layer helps shield the planet from dangerous ultraviolet rays. O'Keeffe, Jillian. "10 Causes of Air Pollution." Sciencing, https://sciencing.com/10-causes-air-pollution-6890.html. 19 April 2018.